Playtonic Games has officially announced that Yooka-Laylee‘s 64-bit update is now available on the Nintendo Switch (and PC). Fans of classic 64-bit titles like The Legend of Zelda: Ocarina of Time and Super Mario 64 will undoubtedly feel right at home with this latest update. Called the “64-Bit Tonic,” this lets people lower the in-game resolution to 64-bit. It even adds an old TV frame around the edges of your screen to really nail the authenticity for this update. Just make sure to visit Vendi in-game to grab this treat! Here’s a trailer showing off the Yooka-Laylee 64-Bit Tonic in action. For those who are unfamiliar with Playtonic’s Yooka-Laylee, it is an open-world platforming game made by the brilliant minds behind games like Banjo-Kazooie and Donkey Kong Country. Yooka-Laylee features large, open levels with a bevy of characters to meet. There is also a ton of collectibles for people who feel compelled to collect everything. Yooka and Laylee set out on a journey to stop the evil Capital B, who’s ultimate goal is to absorb all of the worlds books and then convert them into profit. Along the way you will earn various power-ups, and can even take various different forms depending on the task at hand and the solution that it requires. 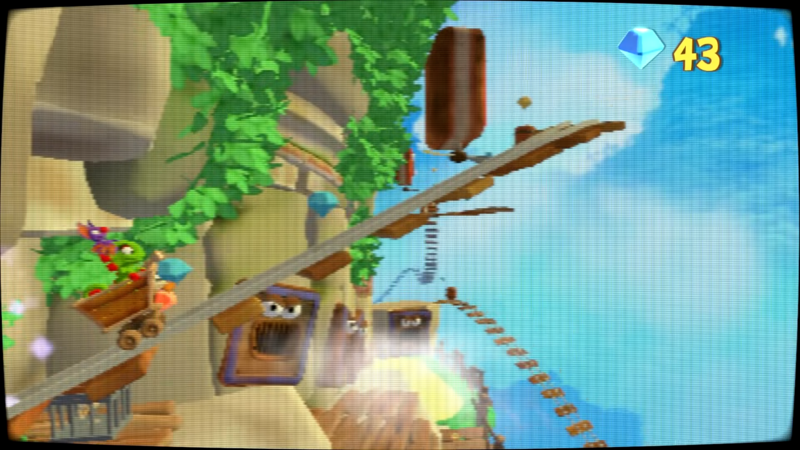 Throughout the game’s many worlds, when completing platforming areas and puzzles, you can find Pagies. These are golden pages which are used to unlock worlds, and to expand the ones you are currently exploring, allowing you to complete even more activities. Each world has a wide variety of activities to win, and puzzles to solve. Much like Super Mario 64, the more you look, the more you will find. There are Bosses to defeat, mine cart challenges to win, arcade games to play, multiplayer games to compete in, and quiz shows, to name just some of the activities you will come across in your travels. Are you excited for Yooka-Laylee‘s 64-bit update? Let us know in the comments below! While it is only on the Switch and PC right now, PS4 and Xbox One users will get it too!